Seikatsu is a word that means “Life” in Japanese. In this game, players contribute to the development of a garden which is known for both its flowers and its birds. Each player has a pagoda from which they view the garden, and the player who has the most breathtaking view of the garden will win this game. The garden is a hex shaped affair with pagodas on three vertexes. The central space of the garden is filled with a koi pond – leaving 32 spaces in the garden. 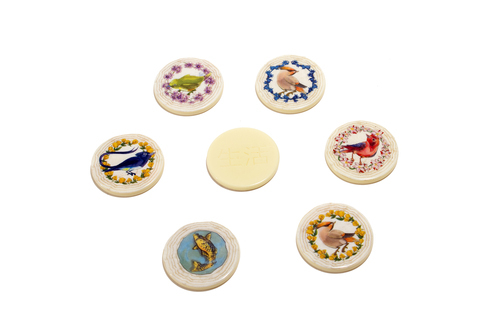 Conveniently, there are 32 garden tiles in a bag to be played – 28 have a bird in the center and a flower type around the outside. The game begins with a few tiles being randomly seeded onto the board adjacent to the central koi pond. There are also 4 koi pond tiles which are added to the bag after setup. Each player then draws two tiles from the bag as their starting hand. 1] Play a tile – play a tile from your hand onto an empty pace on the board. It must go adjacent to another tile on the Garden board. 2] Score Matching Birds – Look to see if you have formed a Flock of Birds – score 1 point for the bird that you played and one point for each matching bird on an adjacent tile. If you do not match any adjacent birds, you score nothing. If you have played a Koi Pond, it counts as the bird of your choice for this turn. In later turns, it is just a pond. 3] Draw a tile – Draw a new tile. Duh. When all the tiles are played, there is final scoring. Now it’s time to score Flowers as you view them from your pagoda. 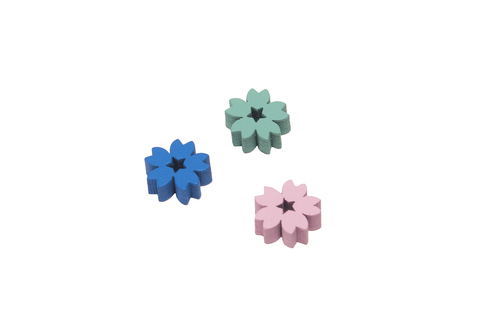 In each row from your pagoda, you score 1/3/6/10/15/21 pts for 1/2/3/4/5/6 flowers in the most common flower in each row. There are rules for a 4p teamwork game as well as a solo game – though to be honest, I have really much preferred this as a 3p game. When you play that way, all the axes of the board are used, and it makes for a much more strategic game. 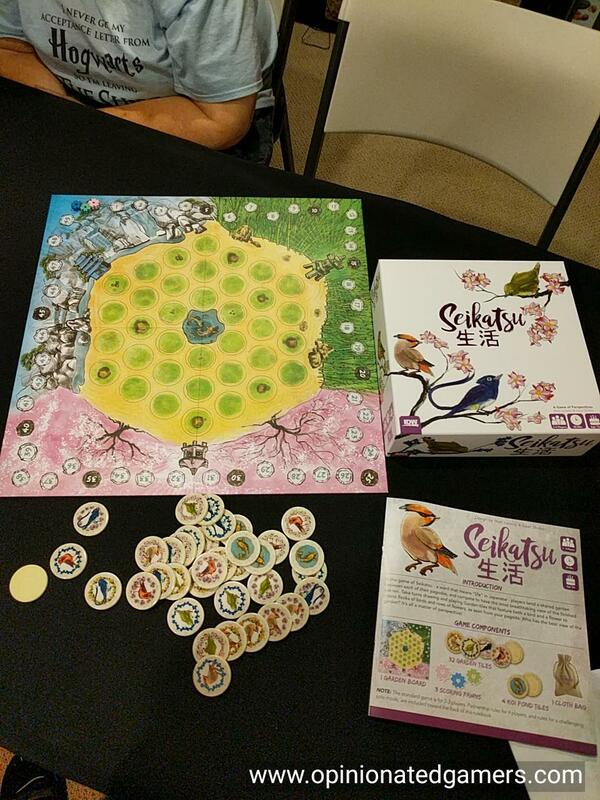 This game uses a Japanese garden as its setting, and the game takes on the feel that many Japanese games have – one where each move, while simple, has multiple actions or meanings. 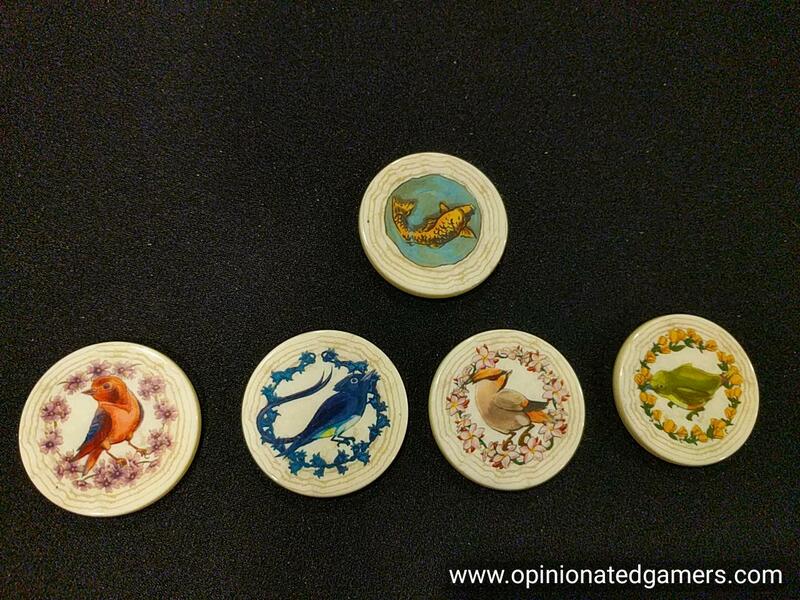 The decision each turn is usually to decide between short term scoring based on adjacent birds versus setting up long term end game scoring by matching flowers. Occasionally, the stars will align and you will have an obvious play which meets both ends – but more often than not, even with a hand of three tiles, you’re faced with a difficult decision between competing desires. It seems like the majority of the scoring should (and usually does) come from the endgame reckoning of the flowers. However, the contribution of the bird scoring during the run of play is large enough that you simply cannot ignore it. This leads to the excellent balance of play and constant struggle to choose between your options. One important note – the illustration in the rulebook about adjacent bird scoring is incorrect. There is an updated image posted in the Boardgamegeek forums. Essentially, follow the wording of the rule – that is, you score 1 point for each bird that is the same WHICH IS directly adjacent to the tile that you are playing. We were confused for a bit when learning the game until we found the clarification online. The components are nice. The tiles are nice weight and composition with the nice added touch of texture on one side (Japanese writing). This allows you to make sure that you don’t accidentally show your tiles to your opponents when drawing from the bag. The bag works great for me, but one of my friends with huge hands had to just dip his fingers in the bag to pull out a tile. The graphics on the boards is fine, though I do think that two of the flowers on the tiles could stand to be a bit more distinct. The two pink-ish one really do look alike to me if I’m not looking carefully. This game is a great abstract strategy game. Each individual turn is quick, so the players remain engaged. As I mentioned, I really prefer the 3p version of the game as each move affects all players/all directions, and it makes for a nice tense game. It’s definitely something that my gaming group liked. That being said, I think the game could serve as a nice entry point for novice gamers. The rules are really quite simple, and the strategies are not overly complex. My only quibble with this being a great gateway game is that the arithmetic scoring chart for the end game scoring isn’t printed somewhere on the board. It’s no big deal to tell gamers that it’s 1/3/6/10… for 1/2/3/4, etc. They should be familiar with that and instantly get it. For those not used to playing games though, it isn’t as intuitive/natural, and having a chart on the board that all players could easily reference would have been nice. 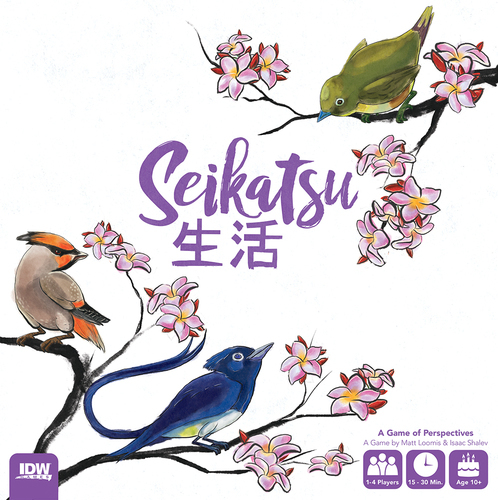 Chris Wray (1 Play): Seikatsu is a simple and elegant game and me and I played one three-player game in about 15 minutes at Gen Con. There are interesting decisions on any given turn — do you go for adjacency points, end-game points, or possibly block and opponent? I most went for end game points and ultimately tied a player going primarily for adjacency points, so at first blush there are different strategies. The tile placement genre field is crowded, but this was a cool little game, and I’d happily play it in the future.